URMIYE, East Kurdistan, — Salt Tsunami caused by the evaporation of Urmiye Lack has jeopardised the lives of many people and no government plan is announced to remedy it. The negative side of Salt Tsunami is making its appearances in Selmas city now. 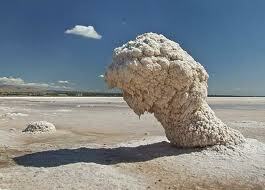 The residents of Selmas are reported to have been suffering from eyes problems caused by salt breezing. According to HRA news outlet, breezing of salt to Selmas neighbouring has put the lives of many people in danger by their breathing of the lingering bits of the salt. Ranges of protests had been launched in the past to raise the issue nationwide with the view of making the government feel accountable toward the Lack. Some plans had been announced in the past to prevent the Lack from drying out including the construction of artificial raining or water shipping to the Lack. But no practical measures have been taken in this respect.